You know what you can't see in this photo? The fact that it was 100 degrees...and my toes...I need a serious pedicure...I used to make time to do it myself...but that time is no longer in existence...and if I do it before I go to bed, then I wake up stuck to my sheet...anyway.. This is wonderful! You look very polished. I love neutrals with a pop of neon. It was all over the runways last season and I know it will continue on being a huge hit in the future. It's as big as color blocking. Wow this entire outfit is perfect!! You are beautiful and have great style!! Loving your natural outfit with the pop of color! That top is bright and I love it. I have never thought about wearing bright bold colors and neutrals the way you have. I need to try this. Love the outfit.. Given me a idea for putting together Neutrals with Bright Pops of color... I'm in the same boat as you.. I have TONS of shoes.. most I never get around to wearing.. So that challenge of New Day New Shoes.. I Gonna do THAT!! Starting October 1st.. for the entire month.. wear a different shoe :) that will challenge me to wear different outfits too... Love your style! i'm loving this new day new shoe idea. i have the same issue as you (first-world problem, right?) i have a ton of shoes and maybe wear 15 pairs! I adore your dress. It's very feminine and demure and really flattering on you. Great color combo and so sheik! 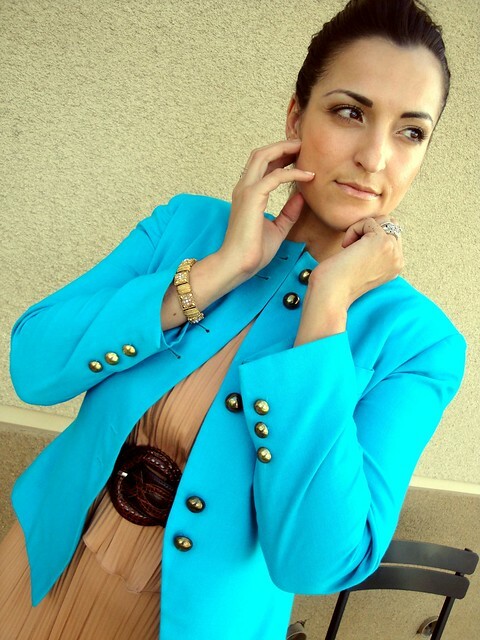 wow the color of this blazer is stunning! Love it with the peach (?) dress! The pleats are so beautiful. You look great in blue! I love the button details on that jacket! Thanks for linking up! I adore the shade of that jacket, ahhhhhhhhhhhhhh. Neutral and neon?! NOT a pair I would've thought of but somehow it's super fantabulous! Maybe it's cuz you're a genius (most likely) or maybe it's cuz you are (or should be) a model so you could sell anything. It's probably a combo of the two.